Barcode label maker software is designed to craft high resolution barcodes, asset tags, receipt tags, price stickers etc. using any of the popular Linear and 2D barcode font standards. Barcode software efficiently runs on all Apple Mac OS installed machines, with wide range of image designing and printing abilities. 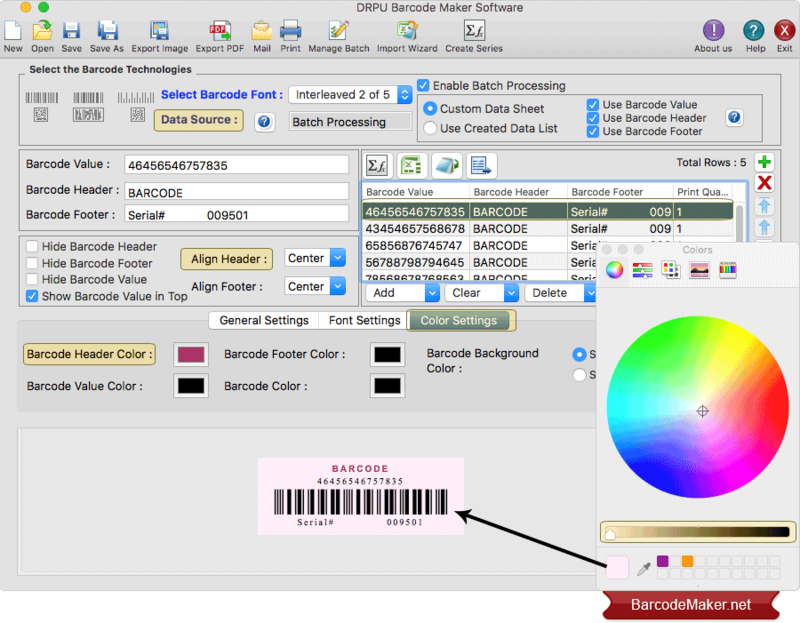 Barcode Maker Software for Mac OS X is featured with a user friendly interface that creates barcode labels widely preferred in all small to large scale organizations. Barcode creator software provides flexibility to save created barcode label in any of the major graphic file formats like JPEG, JPG, BMP, GIF, TIFF, PNG etc. Bar code software is structured with series generating options including Sequential, Constant or Random lists to build bulk quantities of bar code labels useful for commercial purposes. ➀ Software crafts business specific barcodes in any popularly used Linear and 2D barcode fonts. ➁ Provides options to save the created barcode image in any renowned file formats including JPG, BMP, GIF, TIFF, JPEG, PNG etc. ➂ Print preview functionality allows viewing print output sample before final printing. ➃ Barcode system software is enclosed with a barcode image scanning ability. ➄ Multi copies of the same barcode label can be created on a single page. ➅ Software works efficiently on all major Apple Mac OS installed machines.